If you like to fall asleep to Monica, Chandler, Rachel, Ross, Phoebe and Joey on Netflix, you better get your fill now. Based on a new statement from WarnerMedia chief creative officer Kevin Reilly, Friends will likely leaving Netflix for WarnerMedia’s upcoming streaming service at some point in the future. According to TVLine, Reilly told reporters at the Television Critics Association winter press tour on Feb. 11, “You can expect the crown jewels of Warner will ultimately end up on the new service.” This seemed to be his way of hinting at shows like Friends and The Big Bang Theory will eventually make their final bow on Netflix. Friends first landed on Netflix in 2015 and this isn’t the first time there have been reports the NBC comedy would depart the streaming service. 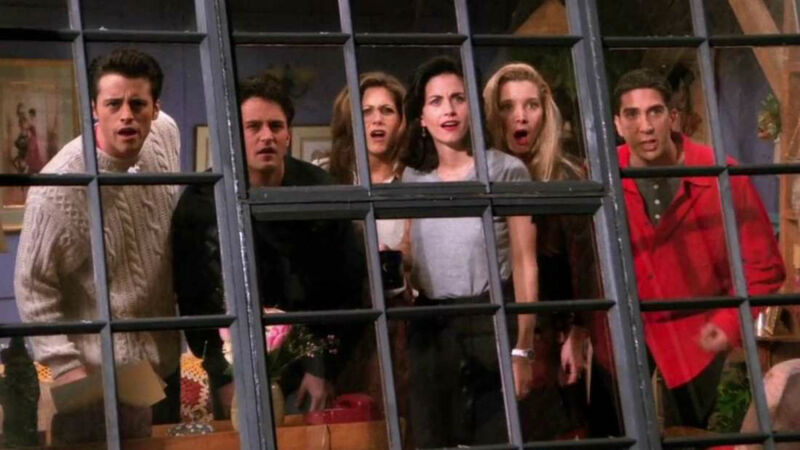 In December 2018, fans became outraged (a Change.org petition was even created) in hearing that Friends might exit Netflix beginning Jan. 1, 2019. Whew! Crisis averted, or so fans thought. As you can imagine regarding the latest news about Friends, fans are once again having strong emotions to what sounds like a very strong possibility of the beloved comedy’s departure. You can check out just a few reactions below, including how many people just can’t afford more than two streaming services and how some hope Gilmore Girls doesn’t leave, either. If its not on hulu or Netflix I won’t be watching it, only thing extra i pay for is starz when @Outlander_STARZ is on. The only good news is at least people can catch Friends reruns on actual television, since it’s in syndication, right? Who knows what will happen regarding Friends and its streaming future, but until then, fans can enjoy their favorite Central Perk gang on Netflix — for right now.